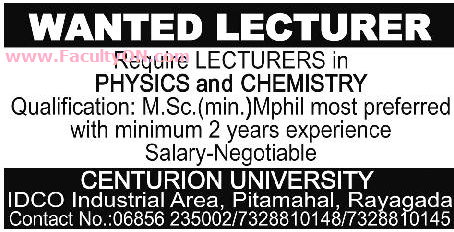 Looking for Lecturers jobs in Universities in Orissa? or Searching for Faculty Plus Teachers Orissa 2018 or Faculty ON Odisha? An university based in Sivakasi named Centurion University, Rayagada has advertised in the SAMAJA newspaper for recruitment of Lecturers jobs vacancies. Interested and eligible job aspirants are requested to apply as soon as possible from 23rd July 2018. Check out further more details below. About University: Centurion University has got NAAC A grade as well as a Class One institutional status from Australian Government in just a short span of five years. Minimum M.Sc with 2 years experience. M.Phil most preferred. How to Apply: Interested and eligible candidates are requested to send their application along with CV, copies of certificates, testimonials and recent Passport Size photograph to the postal address mentioned below.